Professor Roye Wates is a long-time guest lecturer in the Core Humanities, where she speaks to sophomores about the method and meaning of Mozart’s operas. Core students are not the only beneficiaries of her knowledge—she is frequently called upon to give pre-concert talks in the Boston area, and has lectured on various aspects of Mozart’s music at scholarly conferences in the United States, England, Ireland, Austria, and Germany. Her latest book has just been published by Amadeus Press. Mozart: An Introduction to the Music, the Man, and the Myths draws upon decades of thought and study devoted to unraveling the forms, styles, and techniques of classical music. In the following list of phrases frequently used to describe Mozart, which ones do you regard as dubious? More about this list later. All nine items will be discussed somewhere in this book. Tantalizing, isn’t it? You can find the book on Amazon if you’d like to see what she has to say about these nine items, or borrow it from the Core office. Few classical music figures have captured the public’s imagination like Wolfgang Amadeus Mozart. This is due not only to the indisputable greatness of his music but also to the fascinating story of his life. However, the details of this story have become caught up in layers of legend over the years, perhaps most notably in the brilliant but largely fictional film Amadeus. In Mozart: An Introduction to the Music, the Man, and the Myths, author Roye E. Wates aims to peel back these layers and reveal what is really known about the composer. What emerges is a portrait of a musician far richer and more complex than the caricature so familiar in popular culture. This book offers extensive biographical and historical background – debunking many well-established Mozart myths – including a generous sampling of letters by Mozart and his family. Also featured are guided studies of compositions, representing every genre of eighteenth-century music: opera, concerto, symphony, church music, divertimento and serenade, sonata, and string quartet. These works are placed in the context of the composer’s tragically brief life and the turbulent times in which he lived. 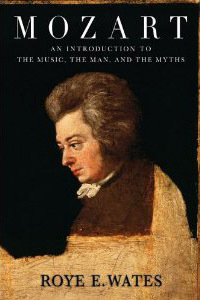 Both enlightening and accessible, Mozart: An Introduction to the Music, the Man, and the Myths provides a unique combination of biographical detail, up-to-date research, detailed musical analyses, and clear definitions of terms. It will appeal to all readers, including non-musicians, seeking to deepen their technical appreciation for Mozart’s music while learning more about the man who continues to captivate listeners to this day.